Biodiesel is a renewable fuel that is predominantly domestically produced. It can be made from a variety of feedstocks including animal fats, algae, new and use vegetable oil, soybean oil, and restaurant grease. 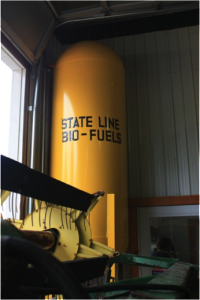 State Line Farms in North Bennington makes on-farm biodiesel made from oilseed crops grown on-site. Biodiesel can be utilized in vehicles in either its pure form or as a blend with petroleum diesel. Pure biodiesel, 100% biodiesel fuel, is referred to as B100 while a blend of 20% biodiesel and 80% petroleum diesel is labeled as B20. B20 is the most common biodiesel blend in the United States; another common blend is B5. Blends up to B20 may be used in any diesel engine manufactured after 1993 with little impact on performance. Most original equipment manufacturers (OEMs) approve the use of biofuel blends up to B5 in their vehicles without voiding parts or workmanship warranties. Please check your OEM’s website or contact your dealer to determine which types of biofuels should or should not be used in your vehicle. B20 and lower-level blends of biodiesel have not shown to have negative long-term effects on engines. Biodiesel has a higher lubricity than traditional petroleum diesel and thus can reduce the wear and tear on engines and, in some cases, extend oil change intervals. While biodiesel has many similar characteristics to petroleum diesel, it burns much cleaner and is biodegradable and non-toxic, making it overall safer for environmental and human health. The burning of biodiesel emits lower levels of CO2 particulates and other polluting compounds in comparison to regular diesel fuel. Because it is both biodegradable and non-toxic, biodiesel will not contaminate soils and water sources, unlike diesel fuel. To view a map of Vermont’s Biodiesel Network CLICK HERE. Advancing Biodiesel in New England: The key to sustaining and increasing biodiesel consumption in fleets is to identify and address the barriers of alternative fuel adoption. This document outlines twelve barriers and accompanying strategies designed to expand the use of biodiesel as a motor fuel in New England. Click here for a list of 2016 & newer models of diesel vehicles.